This is the first in a series of deals offered by John in Cape Breton. No slight against Capers, really, but I'm impressed by the work in these ads. 1987 Plymouth Reliant - Won't Last Long! 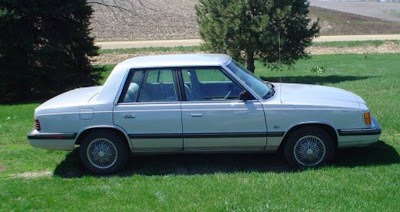 Selling my 1987 Plymouth Reliant purchased it new in the late 80's. Only 290,000KM on it and yours today for 8,500$. Will consider trade for a vehicle similar in value. Would entertain 2005 or newer truck in great shape, no issues like the Reliant. Won't last long picture shows how great in shape car is. "Won't last long" - oh, the irony.